Several years ago I tried eating soy nuts, and I really didn't like the taste of them. Recently, I decided to try again, so I picked up a bag of Soy Nuts from my local Andronicos. I have to say, I am quite intrigued by how low calorie they are compared to peanuts. So, basically, peanuts cost you twice as many points for half as big of a serving. Or, another way to look at it is that you could eat an equal sized serving of soy nuts instead of peanuts for just 1 WW point instead of 4 WW points. Very interesting! 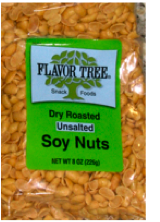 As for the taste, I like the ones I bought this time (from Flavor Tree) a lot more than the ones I had many years ago, so my guess is that some brands of soy nuts are better than others. 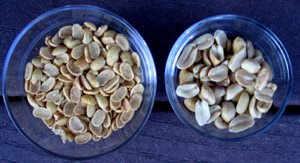 The ones I bought recently are actually shaped like peanuts, whereas the ones I bought years ago were round and not as peanut-like, so perhaps the people behind that brand were not as focused on creating a peanut substitute. So, soy nuts can definitely be yummy, although they aren't quite as fulfilling as eating peanuts (they are much lighter in weight which is why a serving is so much bigger, and they aren't as flavorful, so I would not eat them alone). But, I've found they work really well as a substitute for some purposes! For instance, I think they are good to have around for adding a lot of yummy crunch to some ice cream (you can build a low calorie sundae by adding whipped cream, a few low calorie cookies, and these nuts), Pad Thai, frozen fruit, a stir fry, yogurt (like fage yogurt), or some low calorie steel cut oatmeal. By the way, I'm not advocating eating soy nuts instead of peanuts all of the time. Peanuts are a good food to incorporate into your diet since they contain vitamin E, folic acid, thiamin, niacin, and other healthy antioxidants. Other nuts (in moderation) are also really good food to incorporate into your diet, and are believed to help lower cholesterol, and protect people from heart disease and other ailments. Soy also has good properties (the soy nuts I bought are literally made from dry roasted soy beans -- nothing added), but in a different way since soy is high in protein and it has a lot of iron in it. In short, eating either in moderation is probably best. You can buy soy nuts at almost any grocery store. Just be aware that the ingredients and caloric content may vary (as well as the taste).